This is one of the most popular short hair style in this year, the always quirky Drew showed off her short new bob hairstyle. 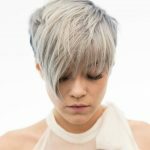 The length of this bob cut is cut into a solid line with minimum layers cut around the edges to create a little texture and shape. Drew is never afraid to try new hairstyles and this hair risk certainly paid off. This great short bob hairstyle is easy to maintain with regular trims and needs only a little product to style. This classy short bob hairstyle is great for women over 30, and perfect for those with Oval, Oblong, Square, and Diamond face shapes.